Life can resume now, all those 5-6am bedtimes can go away and perhaps we can all catch up on our sleep debt. Spain for the first time in history have reached the final of the World Cup AND won it! The game last night between the Netherlands and Spain was a little underwhelming, but sadly the final game is usually like that – there’s too much at stake, too much pressure and no one wants to make a mistake. Too many nerves, too many missed chances. Even the golden booties contender Villa was fluffing it. I have to say though my biggest disappointment for the match was not any player or either team…but the referee. He had some shocking decision, I was expecting more from my British homeboy. But then no-one can say he was biased as he made some shocking decisions against both sides. Honestly though I think #NED came out worst off…Puyol should have gotten a second yellow for pulling Robben back enough to stop him scoring and been sent off. And not awarding a corner when the final free kick clearly deflected of the #ESP wall was shocking…even worse when Spain scored from the next play. But then he did miss a couple of good chances too. And well he did complain far too much getting himself a yellow card for his troubles. Come on dude, you should know better than that. It’s football, what is done is done (apart from when it comes to Villa rolling around on the floor, you can get a yellow card for something the ref didn’t even see). It was a rough game, with a mad flying kick from De Jong (man that looked painful), at times with the Dutch tackling it looking like UFC2010 not World Cup 2010. Sadly from the amount of yellow cards, I suspected in the 2nd half or in extra-time there would be a second yellow card resulting in a sending off. Unfortunately that happened in the 111th minute against John Heitinga, put the Dutch down to 10 men…and changed the game. You can’t take it away from Iniesta though, his goal was superb. No doubts about that one. Oh well, Netherlands can whinge about it all they like, but it’s over now and Spain proudly hold both the Euro 2008 crown and are the winners of the FIFA 2010 World Cup. I just gotta wait another 4 years until England gets embarrassed again in Brazil. Anyway it was no surprise, Germany was the only other team in the World Cup playing real football and Spain went in as favourites to win. And well whilst Germany had the raw talent, their team broke down when they came against an experienced team, a team with real resolve. That’s the down-side of playing youngsters, they don’t have the composure or stomach for the high pressure games. Yes they can rip weaker teams apart, but put them against a team like Spain that WILL NOT lose their head..it’s tough. Player of the match for me was definitely the captain and superbly skilled keeper Casillas. Quite probably the best goalkeeper in the World right now. Anyway congrats to Spain! Let’s see what you can do in Euro 2012 and if Germany can groom their team by then. Anyway that’s that, World Cup fever is over…can catch up on some sleep and resume normal blogging soon. Hope you all enjoyed the football and well honestly World Cup is truly 1Malaysia, when EVERYONE comes together to support their favourite team. well, is sad that my Favorite team Denmark had disqualified too early. And Congratulation to Spain and wish Paul the octopus good luck for his life lol. The bloody Dutch weren’t even playing football. they were STOPPING Spain from playing football. They were flying into tackles and deserved way more yellow cards. And that flying kungfu kick De Jong gave Xabi Alonso right smack in the chest? That should have been a straight red, that. 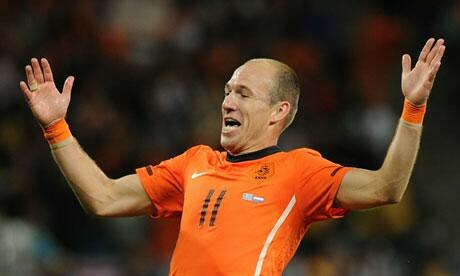 spain tried to play football, the dutch were only interested in stopping the play, flying dutchmen all! Another few more days, everything will fall back to normal..
kianfai87: Yah, well it was an interesting World Cup at least. maRCus: Heh same here, but knew Spain was gonna win. Vicky: Hahaha yah life back to normal now. TZ: It’s a new cup each time no?